This walk: 2013-1-16. Granite/country rock exposure, Leeper/Leapra Cross, Mariners Way, slotted gatepost, signpost, Leapra Brook, massive gateposts, West Coombe Farm, ash house, impressive corner stones, leat, reservoir, hut circles, Shapley Tor. Link to Google Satellite view of the area - the car park is at centre-top edge of the map. This walk links to 23rd September 2009, being the same walk in reverse. A fairly rare geological exposure showing the meeting of the Carboniferous era granite that forms the up-welled dome that constitutes the hard upland of Dartmoor (the horizontal rock at the top of the photograph) and the surrounding metamorphic aureole or "country rock": in this area this consists of Upper Carboniferous sandstones and slates and Lower Carboniferous slates, cherts, limestones, sandstones and volcanics, all altered by the heat of the granite intrusion. Ruins of a building of unknown function - a barn might be a good guess? I wonder if this was here in olden times for the mariners? A view of Leapra Brook. This must be one of the biggest gateposts anywhere? Believed once featured in Rocks & Minerals Magazine. West Coombe Farm, this barn was added over the pre-existing track and, it is reputed that, the Mariners Way then ran through the barn. It may have been that sailors could spend the night here before continuing their journey - a sort of primitive bed and breakfast, or maybe "barn and breakfast"? Impressive corner work - someone in these parts clearly had a fixation on large stones! An old barn, not a linhay as I originally thought as a linhays is essentially a lean-to built on the back of a building and this is free-standing. It might have been a mowhay, for storing mown hay, although the sides are open. On our farm, it would have been more of a tractor shed. The slit - the previous walk, on 23rd September 2009, has a photo taken by leaning over the wire fence and showing the larger opening on the other side for taking out the ash. The farm, looked at from the ash house. Stream, seen from the steep climb (56 metres up over 270 metres along, i.e. 1 in 4.8) from West Coombe Farm, going south-west to Coombe Down. Old building passed on the climb. Possible old leat - there is a disused mine shaft near here, marked on the map. Believed reservoir to do with old mining activities. Hut circle at SX 70424 81983. Shapley Tor is conquered, SX 699 821, elevation 480 metres (1574 feet). View back to the car park. 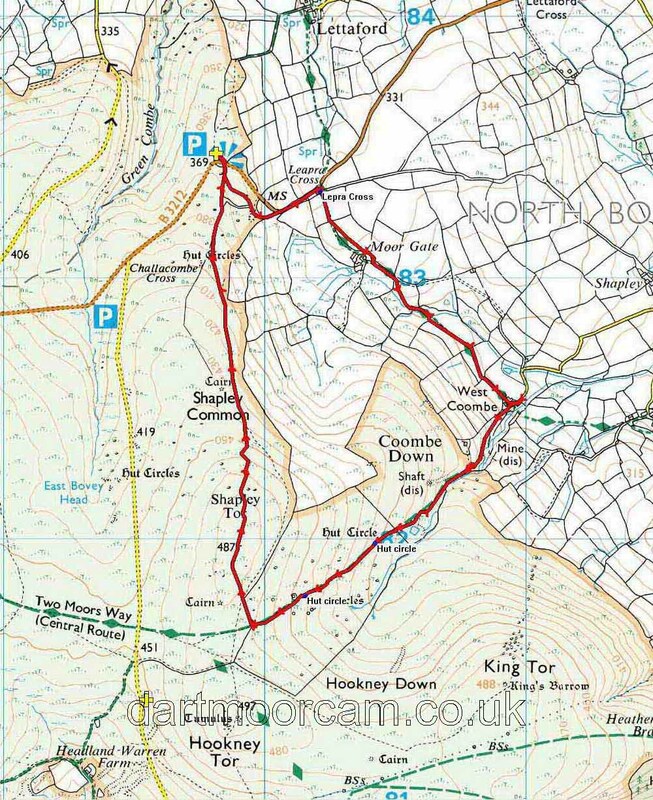 This walk was reached from the Two Bridges direction by driving through Postbridge, past the Warren House Inn, passing the turn-off left for Fernworthy forest, the turn-off right for Grimspound and then stopping at the car park on the left of the road just before leaving the open moor at the P symbol and yellow cross on the map. Distance - 5.61 km / 3.49 miles.